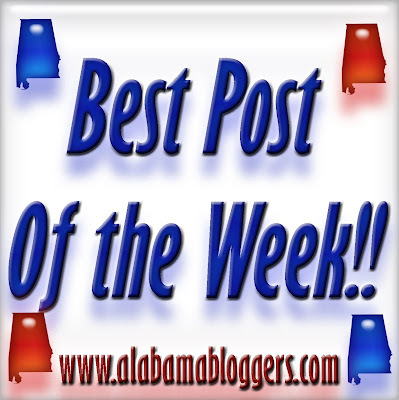 Alabama Bloggers: Best Post of the Week: Feature Another Blogger Week! Wade made a great suggestion last week that we have a "feature someone else" week. So, this week, link in the best post you read this week (or last week) by ANOTHER Alabama Blogger. In your link title, include your name or blog and their name or blog, and let us know in the comments why you chose their post! Jill made me laugh TWICE this week, so I chose one of her posts to share with you. Obviously, I had to nominate Rachel's post on her great in-depth investigation on the notorious Birmingham daycare, Uncle Joe's Tot Locker. Kudos! Country Fried Mama's post made me laugh & think! I HAD to say Rachel's post on the Tot Locker! BRILLIANT and oh so funny! I featured my buddy Jerri. She has been quietly blogging along for a while (longer than I have). She loves to read blogs and truly does it for her own satifaction and not to please anyone else. Jerri owns an AWESOME antique store in Cleveland Alabama. 7. Will Blog for Shoes - A great little posts on the sometimes frustrating rocky road to buying a home. 8. Unexpected Grace - Terrific solutions for lighting for apartment renters. 9. Erin Shaw Street - My friend goes all out for an art bash in Birmingham, which now feels like home to her. Looking forward to seeing your picks. Thanks so much, Wade and Bama Belle! You are both too kind!! Posting Selma's new Welcome to Selma sign at the foot of the Pettus Bridge. But I do question the date of Selma's establishment as shown on the sign! Uh oh, just read the instructions! Posted my own blog, but after checking the others out, I like the Just Vintage blog about picking through the junk. Love the appliqued table scarf if that's what it is!